Welcome to Balanced Body Chiropractic. We serve patients in the St. Charles and St. Peters area, and our commitment is to help everyone be pain-free, and have optimal health. "To me, there is no greater reward to hear that a patient is now pain-free, or at least significantly better, and to see their smile and relief." 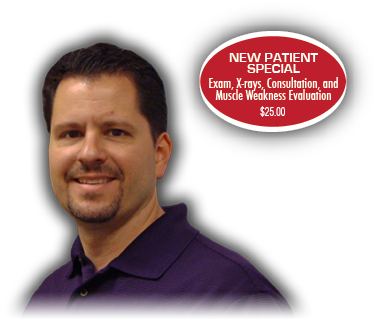 Dr. Gary Hagner, D.C. was born and raised in St. Louis, Mo. He graduated from Hazelwood Central High School, and then went on to acquire his B.S. in Human Biology. Like many others, he did not believe or know much about chiropractic until he hurt his low back in 2001. After trying the medical route with no relief, he was referred to a chiropractor. After the first week of receiving chiropractic adjustments, he was 90% better. 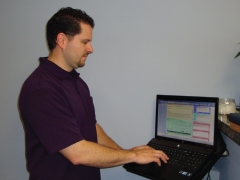 "A year later, I pursued my dream to become a chiropractor. In 2006, I graduated with multiple honors from Logan College of Chiropractic in Chesterfield, Mo. In 2010, I opened a brand new office in St. Charles, Mo, large enough to have two chiropractors and a massage therapist." Before treatment can begin, it is important to ask a few questions about the areas of issue, past history of injury, and lifestyle. 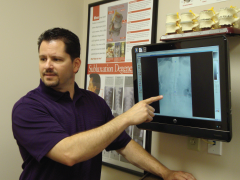 X-rays are usually required to intelligently diagnose the location of pain and cause of it as well. We do the x-rays right there and start treatment, so that relief can begin immediately. This is the first stage of care with the primary goal to provide symptomatic relief. The technique used to quickly and effectively reduce pain and other discomforts is called Acupressure. Acupressure is a traditional Chinese medicine bodywork technique based on the same ideas as acupuncture. It involves placing physical pressure, by hand, elbow, or with the aid of various devices, on different pressure points on the surface of the body (which may be far distant from the symptom, related by what is called the meridian system) to bring about relief through greater balance and circulation of fluids (blood, lymph) and metabolic energies in the body. Patients usually feel a significant improvement even after 1 session, My intent is to relieve and correct, and help my patients have a better quality and pain-free life. This stage consists of correcting the cause of the condition and promote healing and rehabilitating to the injured tissues with scheduled adjustments. Once pain and discomfort have subsided, tissue healing and functional correction is usually incomplete and will require additional treatments. Depending on the patient’s response, after a period of time, the patient will graduate to a level of wellness care, and just come in for checkup to maintain level of health and well-being. This final stage consists of periodic spinal care to prevent the formation of new injuries, minimize flare-ups of old injuries, and prevent degenerative spinal processes from occurring. "The greatest reward is to alleviate someone’s pain and suffering and see them return to a healthy, pain-free life!"